The Polaris Duo are an award winning saxophone and harp duo based in Manchester. They have performed extensively around the UK at venues including the Bridgewater Hall, Buxton Opera House and the World Saxophone Congress. 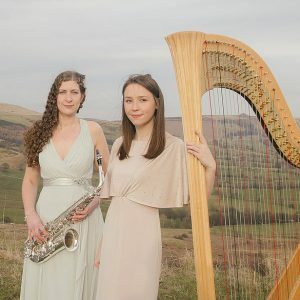 They were featured as ‘New Generation Artists for Lake District Summer Music and were 2nd prize winners at the British Harp Chamber Music Competition. The Polaris Duo is dedicated to presenting new music and expanding the repertoire for this uncommon pairing of instruments. Having developed an eclectic repertoire over the past 7 years, they are delighted to be celebrating the launch of their debut album ‘Illuminate‘ at the International Anthony Burgess Foundation. The album includes works by Manchester based composers Andy Scott, Melissa Douglas and Rob Buckland, alongside arrangements of works by J.S. Bach and Camille Saint-Saens.